Now back to that three to five pounds of bacteria we carry around... Much of the weight comes from the bacteria's cell walls, or "jackets," as Grimes refers to them. Firm, yet flexible, they are composed of peptidoglycan—a mesh-like polymer made of protein (peptides) and sugar (glycan) molecules. 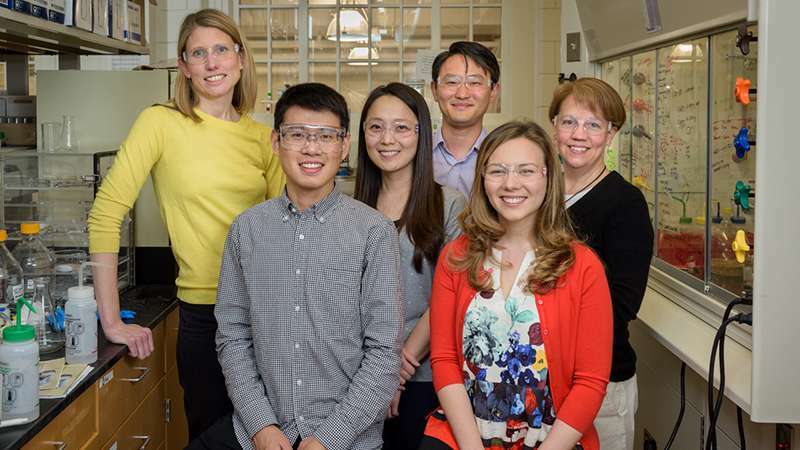 During the past four years, Grimes and her team have figured out how to label and light up the sugar backbone of the cell jacket—the first lab in the world to do so. "We wanted to chemically make a new building block—like a Lego with triangles on top instead of circles—and then feed this material to the cell, which would use it to build its jacket without affecting anything else," Grimes explained. "Once the label was incorporated, we figured we could put 'flashlights' on it, which would help us to visualize the cell fragments and begin to identify immunostimulatory environments." No one had ever labeled the glycan like this inside bacteria before, Grimes said, noting that the approach comes from the relatively new field of bioorthogonal chemistry, in which chemical reactions are done in a living system without interfering with that system's natural processes. She continues to marvel at how her students—both as individual scientists with unique strengths and as collaborators—managed to clear every hurdle they met, even when the prospects of success seemed a bit dim. "Bacteria are very 'green,'" Liang said. "They actually expend a lot of energy to create this polymer—peptidoglycan —a nd they want its building blocks back." Doctoral student Kristen DeMeester developed a synthesis to install bioorthogonal functionality (the "triangles")—either an alkyne or azide—onto the sugar building blocks and tested the response from the cells. The bacteria liked it and were given their flashlights. But how do these labeled fragments affect the immune system? Enter collaborator Michelle Parent, associate professor of medical laboratory sciences at UD, and doctoral student Ching-Wen (Sandy) Hou, who works with macrophages—cells that find and eat foreign bodies. "To see these graduate students work together so seamlessly and not let their egos get in the way—that's fantastic," Grimes said. "My colleagues at other universities ask, how did you get your students to work so well together? I think this was the best collaboration I've ever experienced."